Editor's Note: This post was originally published in September 2014 and has been revamped and updated for accuracy. Starting an exercise program or changing your routine to get your family more involved in fitness is an admirable goal. But we all know how tough it can be to create new fitness habits. Luckily there are ways to make it less painful for everyone involved. 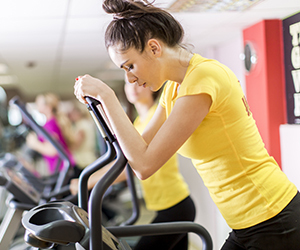 Take a look at these 4 helpful tips for making your new workout routine stick like glue. Interested in getting your whole family more healthy? It’s great to have high expectations for yourself, or your family, but if you are new to the gym, set goals that you know you and your loved ones can achieve. Most people who set out to make it to the gym five or six days a week right off the couch, are disappointed when they only get three days of exercise in. Be smart and set a moderate goal of two to three days at first, and chalk up some wins for yourself when you hit your goal right off the bat. Developing a new habit takes time and commitment. Write down your intentions in your day planner, or enter it into your phone calendar. If your exercise program is scheduled into your day, you’ll be less likely to neglect it. It doesn’t matter how hard you work out, if you aren’t fueling your body with proper nutrition, it won’t give you the results you want. One way you can help yourself along and see faster results, inspiring you to stick to your new workout routine, is to take care to remember your pre and post workout meals. Pre workout meal: eat something 30 minutes before you exercise to ensure your body has plenty of energy for calorie burning during your workout. Post workout meal: eat something within 30 minutes of your last set to make sure your muscles get the right nutrition to support recovery from all the hard work you just put in during your workout. Your body gets bored of the same old thing, just like you do, and it will cease to change and adapt when your workout gets stale. Make sure you keep things fresh by adding different exercises, varying your sets and reps, and mixing up the types of cardio you do. If you need inspiration, try a new class, or consider hiring a trainer who can spice things up for you.